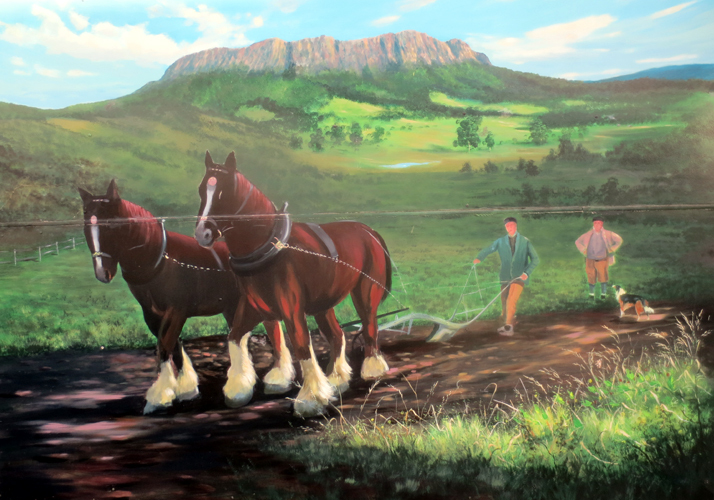 Midgley of Felkirk, Shafton and farming pioneers of Tasmania. York. Morrow of the Purification, 12 Edw. 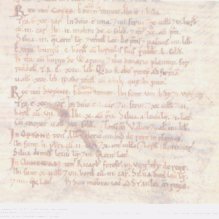 III, 1338.Westminster. Quindene of Easter, 19 Edw. III, 1345. Ch. 25th July 1781 d. 10th Sept. 1833. Buried All Saints Wakefield. Married Sarah Sampson who was christened 11th May 1788 Married: 15th April 1811, died 15th Feb. 1866. Proprietor of the Dolphin Inn, Doncaster. 1. Sarah Ann Midgley marr. James Bywater of Castleford. 2. Joseph Midgley born 20th Aug. 1827. 3. Timothy Sykes Midgley, [See Tasmanian link Page with incorrect first name!] farmer born 27th July 1849 probably at Doncaster. Died 13th September 1922 marr. firstly [25th Jan 1874] Elizabeth Huntington of Hagley, Tasmania. Married secondly [8th Sept. 1878] Ellen Milnthorpe 4th daughter of William Milnthorpe and Sarah Horsfall of Newland Hall, Altofts [nr. Normanton], Yorkshire. Both signed their own names at the wedding [15th October 1836] and both were of the parish of Normanton3. Timothy and Ellen had three children, Archibald, Lucy and Joseph. It would appear that Timothy migrated to Tasmania on the "Great Britain" on 25th December 1870 , his wife Elizabeth died probably in childbirth with their second child in 1877 and he returned to Normanton sometime between in 1878 to marry Ellen. They then migrated on the "Orient" 15th March 1879. He became a farmer at Pine Road, Penguin, Tas. 4. Thomas Midgley b. 6th April 1851, probably at Doncaster d. 1st Sept. 1936. Migrated on the "Great Britain" 25th Dec. 1870 with his brother Timothy. Married Lettitia Middleton [Middleby] on 7th August 1879 She was born Emu Bay [now Burnie] Tasmania 9th June 1856 and died 22nd Jan. 1942. 5. Lucy Hirst Midgley b. 20th Dec 1823. Married Samuel Cope of Wakefield, West Yorkshire. Three children. 6. Betsy b. 12th October 1854, married John Pritchard, Armley, Leeds, West Yorkshire .They had four children. 7. Benjamin Sykes Midgley. b. 30th April 1856 died young [4th Dec 1856] at Doncaster. 8. John b. 29th May 1860 migrated to Tasmania on 15th March 1879 on the "Orient" with his brother, Timothy and Timothy's new wife. John married Louisa Sykes [his cousin] who was born at Sassafras near La Trobe, Tasmania on 27th July 1861. she was the daughter of Benjamin Sykes and Christina Plapp. 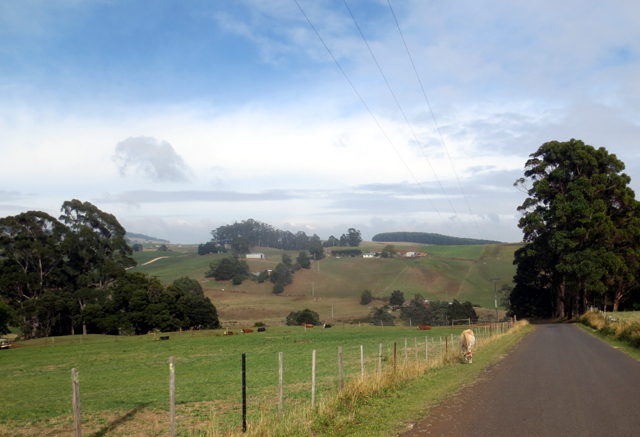 John became a farmer at North Motton, Tasmania. 9. Samuel Hawkesworth Midgley b. 21st January 1865. 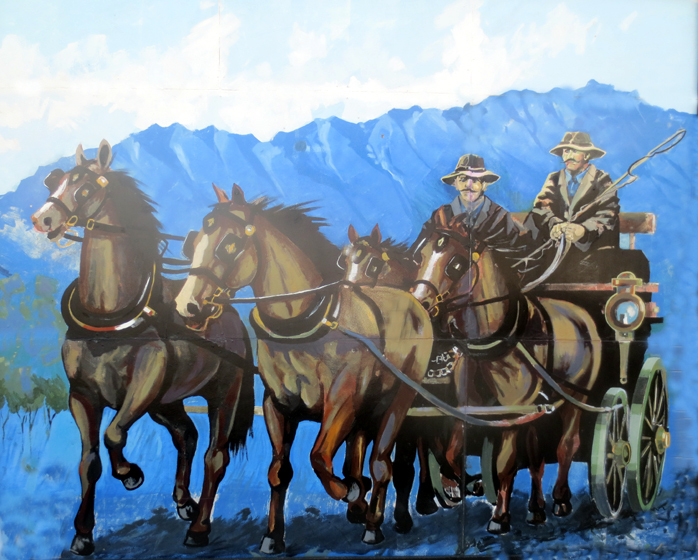 Migrated to Tasmania on the "Orient" on 15th March 1879 with his brothers Timothy, John and Timothy's new wife Ellen.. He is a Boer War veteran and later migrated to New Zealand in 1909. Died 20th May 1936. Samuel married Max Wilhelmina Manson who was born 26th Jan. 1877. They were married in 1911 and lived on Banks Peninsula N.Z. and then Timaroo N.Z. Five Children all born in New Zealand. 10. Ellen Sykes Midgley b. 15th Sept. 1861. Married Basil Tomlinson, wheelwright. Basil purchased the old Midgley home on Shafton Common, Shafton, West Riding, Yorkshire but sold the farm and kept the orchard. Had one child, Basil. 11. Mary Emily Midgley b. 11th May 1868. * Evidently a transcription error. The eldest is Milnthorpe* Malcolm Midgley 22nd Light Horse Regiment, R.A.F., R.A.A.F. Reserve, member and vice-chairman of the Hellyer Reg. Library Advisory Committee, 5 years vice-chairman of the Tasmanian State Meals on Wheels. A.F.C. O.A.M . a/c, S/LD R.A.F. SQD. ENG. 1940-45, Farmer, "Killah", Riana, Tas.married Joan Iris Herbert. Midgleys Road, Riana, Tasmania. 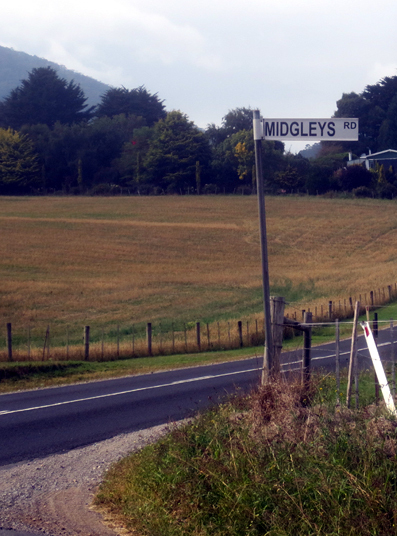 Midgleys still run a dairy farm on this road. Killah, Riana, Tasmania - settled 1885. Today this is a dairy farm. 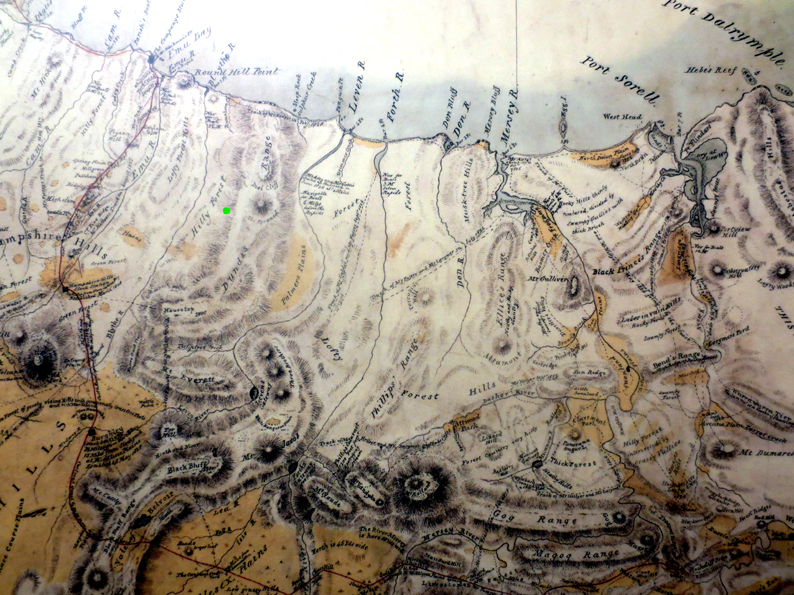 Green dot - Today's approximate location of Riana on the Van Diemen's Land Company [V.D.L.C.] map of September 1828 by Henry Hellyer. The red line is the road from Emu Bay [now Burnie] to Hobart etc. Later the town of Penguin developed on the coast and from there Pine Road was driven south into what is now the Riana district. Mary Ann Milnthorpe Hd W 73 Retired, formerly farmer, born Altofts. Thomas Milnthorpe So U 38 Farmer6 110 acres employs 4 labourers, born Hilltop. William Milnthorpe Hd M 37 Joint Manager of a Farm of 110 acres employs 4 labourers born Altofts. Charles So 14 Farm Managers son, born Normanton. Ann Da 12 Farm Managers daughter, born Normanton. Mary Ann Da 9 Scholar, born Altofts. Thomas So 2 At Home, born Altofts. William was born abt. 18144 and became a joint manager of a farm at Hilltop in 1851. He was married by licence 15th October 1836 to Sarah Horsfall both of the parish of Normanton3. William had two older brothers, John b. 1809 [married Hannah Denison, 31st May 1830 both signed of the parish of Normanton3] who is described as a farmer of 180 acres employing five labourers in the 1851 census and Thomas 9unmarried0 described as a farmer of 110 acres employing 4 labourers4. 5. Thomas b. abt. 1849. There were contemporaries, possibly cousins to William Milnthorpe in Ann born abt. 1839 at Normanton and Charles b. abt. Normanton children of ___________ Milnthorpe, described as a Farm Manager4. A John Milnthorp is mentioned as the proprietor of the Poplar Inn, Normanton in Kelly's directory of 1901. * Note: The name Milnthorpe originates from the place of the same name near Sandal Magna Castle, Wakefield. 1. Pedigree kindly provided by David and Milnthorpe Midgley of Riana & Launceston, Tasmania. 3. Marriage Index for 1813-1837, Normanton published by W. D. F. H. S.
4. 1851 census for England. 6. Also mentioned in Kelly's Directory 1901 as Samuel Milnthorp, a farmer. 7. Helen is Timothy Sykes Midgley's great-grand-daughter who resides in Tasmania. 8. Feet of Fines for Yorkshire, 1327-1347. p. 177. 9. Y.A.J., vol. 12, (1893), p. 59. Copyright © Tim Midgley 2002, revised 10th March, 2019.